Hummingbirds : Spotted Wing Drosophila Latest information from the NYS IPM Program. A ruby-throated hummingbird, native to New York, visits a typical feeder. The diet of an average hummingbird consists mostly of flower nectar and insects. Flower nectar provides sugar to support their high metabolic rate… even higher during flight due to their rapid wing flapping rates. The insects hummingbirds eat provide them with protein, amino acids, and necessary vitamins and minerals. The insects must be small enough to swallow whole during flight – watch out, SWD! Hummingbird prey includes (but is not limited to) small beetles, flies and fruit flies, gnats, mosquitoes, and spiders. The nectar that hummingbirds drink from flowers is simply a sugar solution. This can be easily replicated for a hummingbird feeder. The most common solution is 1 part table sugar to 4 parts water. The sugar solution should be boiled after mixing to drive off chlorine and kill yeast and bacteria, then cooled. This can then be put in a feeder. Feeders should be red or have red trim, because red is the best color for attracting hummingbirds. The feeder should be regularly cleaned of insects and the sugar solution replaced. The higher the temperatures, the more frequently the nectar will have to be changed. To follow up on this idea for controlling SWD, I reviewed information from The Cornell Lab of Ornithology. Their FAQ’s have a wealth of information on hummingbirds – all of which supported the idea that attracting these birds into your late summer berry plantings of fall raspberry, blackberry, elderberry, etc. could prove highly beneficial in controlling SWD. In May, hang your hummingbird feeders. Use fairly small feeders at first, and change sugar water at least every couple of days in hot weather or if feeders are in direct sunlight, and every 2-4 days when it’s cooler and feeders are shaded. Flowers in your garden, especially those with tubular red corollas, attract hummingbirds. 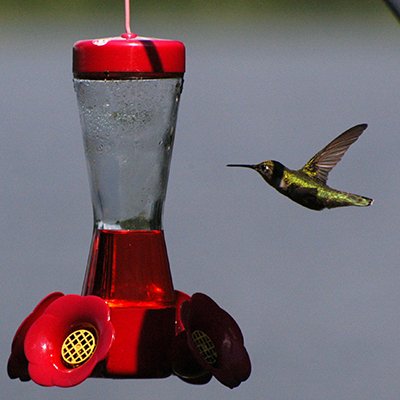 Q. What’s the best recipe for hummingbird nectar? The sugar content of natural flower nectar varies, and is roughly comparable to sugar water mixtures ranging from a quarter to a third cup of sugar per cup of water. During hot, dry weather, when hummingbirds risk dehydration, it’s best to make your mixture no stronger than a quarter cup of sugar per cup of water. But during cold, rainy spells, making the mixture a bit stronger, up to about a third cup of sugar per cup of water, will not hurt your birds and may help them. Q. Should I use red food coloring in hummingbird food? There is absolutely no reason to add any red dyes to hummingbird sugar water. After all, natural flower nectar is clear, and hummingbird feeders have colorful parts that attract hummingbird regardless of the color of the sugar water. Many hummingbird feeders—especially the saucer variety—have a center “moat” separate from where the sugar water is placed. These feeders are easy to keep ants out of by filling that moat with water. The ants that do get down into it drown, but usually just don’t even try. If you have another kind of feeder, make sure it’s hanging by a simple rod rather than string, and coat a center spot all around, about an inch wide, with petroleum jelly. The ants won’t cross that. Q. Should I stop feeding birds in fall so they can start their migration? Keeping your feeders up has no influence on whether a bird will start its journey south. A number of factors trigger the urge for birds to migrate, and the most significant one is day length. As days grow shorter in late summer, birds get restless and start to head south, taking advantage of abundant natural food, and feeders where available, to fuel their flight. Hummingbirds are no different from others and will migrate regardless of whether feeders are kept up. However, we encourage people to keep feeders up for several weeks after the last hummingbird leaves the area, just in case a straggler shows up in need of additional energy before completing the long journey south. Q. How much do birds eat each day? This varies depending on the caloric value of the food, the bird’s activity levels, and the temperature of its environment. Hummingbirds can consume 100 percent of their body’s weight in sugar water or nectar every day, in addition to as many as 2,000 tiny insects! Before migration, it’s not unusual for a hummingbird to double its weight, adding a huge amount of fat to power the long journey. Q. Why do hummingbirds fight so much? Q. Why do I see fewer hummingbirds in midsummer? Adult male hummingbirds aggressively defend their territory, and if your yard is within the territory of one, he may drive all other male hummingbirds away during the nesting season. If you have a nesting female nearby, she will visit your feeder only periodically, spending most of her time incubating her eggs. After the eggs hatch, she usually concentrates her feeding at flowers that supply tiny insects as well as nectar—insects contain the protein that her nestlings need in order to grow. Once the young have fledged, she continues feeding them for several days until the fledglings have mastered getting their own food. At this time, she may bring them to your feeders to teach them how to take advantage of this easy food supply, too. This is also when males begin migrating, with adult females soon following. So many of the hummingbirds that suddenly appear are actually migrants from farther north, just passing through. Q. Do hummingbirds migrate in flocks? Hummingbirds migrate individually. When a late October straggler in the East is a Ruby-throated Hummingbird, it’s usually an immature bird from further north whose mother got a late start with that nest. Ruby-throated Hummingbirds are strongly migratory, but their bodies need a high level of fat to fly long distances. As people bring in their feeders in fall and frosts kill nectar-bearing flowers, those hummingbirds remaining have to go long distances between feeders, so yours may remain for a week or two before its body is replenished enough to continue. Hummingbirds are surprisingly hardy as long as they can get enough food each day, and they need extra calories during cold spells. When it’s cold, it’s not a bad idea to up the concentration of sugar to 1/3 cup per cup of water to give it more calories, which they burn while shivering. Tragically, some of these stragglers do end up dying, but your feeder really isn’t keeping your hummingbird from migrating. Rather, your feeder is giving it its best chance to restore its body to continue on. Q. There’s a hummingbird at my feeder in the dead of winter. Will he be okay? Hummingbirds are remarkably tolerant of cold weather, so it’s likely your bird will be fine if it can continue to find food. You can get an idea of where hummingbirds have been found in winter by looking at maps from eBird, like this one of Rufous Hummingbird. Thank you so much for this potential intervention! Or is this the ‘silver bullet’ we’ve been looking for? p.s. Would you get Laura McDermont, Cornell’s Extension Berry Specialist, to sign off on this idea? David, it is intriguing to think of doing this. My colleague at Michigan State University who is a zoologist who studies birds contends that our avian fauna can be of help to growers by eating insects that would otherwise attack our crops. I, personally, would love to pick raspberries and blackberries at a farm where hummingbirds might happen to land on my arm or nearby! However, before Laura or others in the Extension community sign off on this we need to test its efficacy.